Morgann Davis with adult students demonstrating how octaves are created on flute. If you’ve taught private music lessons, you know that each student is remarkably unique when it comes to learning an instrument. There are factors of whether they are kinesthetic, visual or aural learners. Perhaps reading music comes easily to them, but keeping a steady beat does not. With younger students, we are responsible as teachers for both diagnosing and providing solutions to these problems. If you’ve taught an adult beginner or hobbyist, you know that the playing field changes entirely! I have had a variety of adult learners come to my studio for flute lessons. 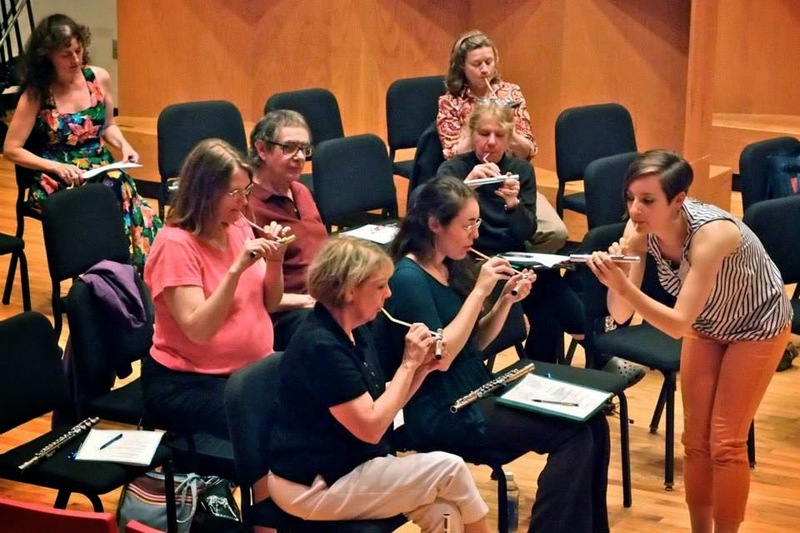 Some are brand new to the flute and are looking for a challenging and engaging new hobby. Others were quite advanced at a young age, but followed a different path through life and are ready to come back to music making. In both cases, adults carry a self awareness most young students don’t have, creating for an interesting and challenging dialogue in lessons. For an adult who has never played an instrument, the first few lessons can be quite challenging. Their level of comprehension is probably quite high, but their facility and dexterity may not be able to keep up quite yet. This is where good humor and open conversation is a must. Most likely, you learned as a young child and don’t remember this frustrating part of the journey as clearly. In this situation, I find it most useful to treat lessons the same way I would with young beginners - diagnosing the issues I see and providing practice solutions to help the student fix them efficiently. You may find this even more satisfying with adults, as they often are more responsible about practicing! For adults who are returning to the instrument after a long hiatus, you may find that they overestimate what level of music they should be playing, or what exercises they should be doing. Their memory of the difficulty of music they played where they left off may motivate them to skip some important steps when it comes to refreshing their abilities. Be sure to speak openly with them about the importance of rebuilding good habits, both so they can play their best, and also so they can avoid any injuries from playing too vigorously too soon. An open mind is important when you are teaching adults. Their ideas and interests may help you find resources you were unaware of, learn new music, or even adapt teaching methods you hadn’t previously used. One of my favorite analogies for talking about air direction and speed came from an adult student! I’m sure to give her credit when I use the idea - after all, her interpretation of my approach is much easier to understand than the words I was previously using! Another of my adult students has introduced me to countless books, collections and pieces because of his own love of the repertoire for our instrument. I look forward to my adult students’ lessons as a refreshing point in my week where I am able to take on the role of both teacher and student. Frequently, these lessons lead to friendships and meaningful exchanges that enhance the lives of everyone involved!